How do you protect your Portugal property budget? Buying a property in Portugal is an exciting prospect, but make sure you plan your finances carefully to ensure you don’t lose money on your currency transfers. Current political instability has caused the markets to fluctuate wildly and it is more important than ever to protect your budget when buying abroad. The Property Buyer’s Guide to Currency will provide you the platform that you need to make informed decisions about your budget. 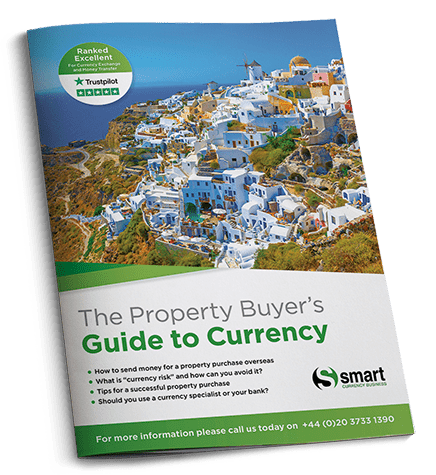 The guide is produced by Smart Currency Exchange, a company from whom we regularly hear fantastic feedback from our Portugal Property Guides readers. They are ranked number 1 for Currency Exchange and Money Transfers on Trustpilot and they are also trusted by companies such as Rightmove. In clear and simple steps, it gives you a strategy for protecting your costs for your dream move to Portugal. How can the Portugal Property Guide help you? The Portugal Property Guide is designed to support you through every stage of the Portuguese property buying process. From how to get started, to finding an estate agent, to covering all the important legal and financial considerations, our experts are here to share valuable advice and to help you every step of the way. We have created the Portugal Property Guide to help highlight the many pitfalls of buying in Portugal and to ensure that our readers can buy their dream home in Portugal safely, without wasting time and money like many would-be homebuyers before them. Over the last ten years, we have built up a network of trusted experts to provide independent, factual guidance on all aspects of buying property in and moving to Portugal. Our Portugal Property Guide country specialist, Laura Richards, has been talking to homebuyers in Portugal and helping them to buy their property in Portugal safely for a number of years. She is at the other end of the telephone at our Resource Centre to answer any questions and support our readers throughout the property buying process.